Irish Garden House: Distracted . . . I can get so distracted . . .
and clean out the garden house. It is now 2:30 in the after noon. I have gone from cleaning up twigs from the lawn after the wind/rain storm last night. (I found a nest that fell from a tree, with two little eggs. It makes me sad when things like that happen. As soon as I carefully picked up the eggs, they broke apart. See how off track I can get, even in writing a post. This is a very loooong drawn out message, believe me! send off a post which wouldn't post last night, no doubt due to the stormy weather. and reminded myself about my goal for the day. to get out doors to start my garden house clean up. First though, I needed to boil some eggs for "egg salad sandwiches" for later. Phone calls interrupted me, (adding to distraction). and resting in their 12 minute pause before the ice water dump. And then I became really distracted. Eggs peeled as smooth as a breeze. 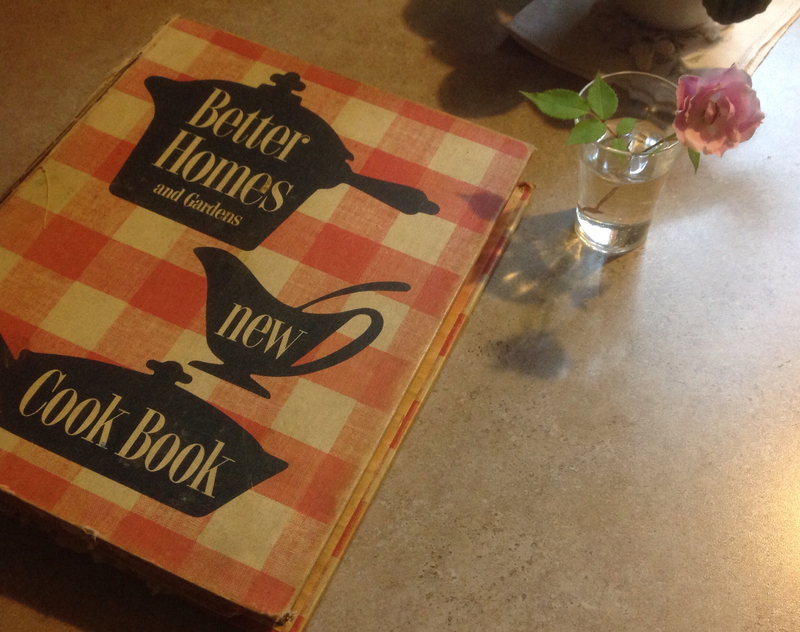 Better Homes & Gardens, red checkered cook book. Reading, egg salad, it sounded more like a salad and I didn't want a salad. 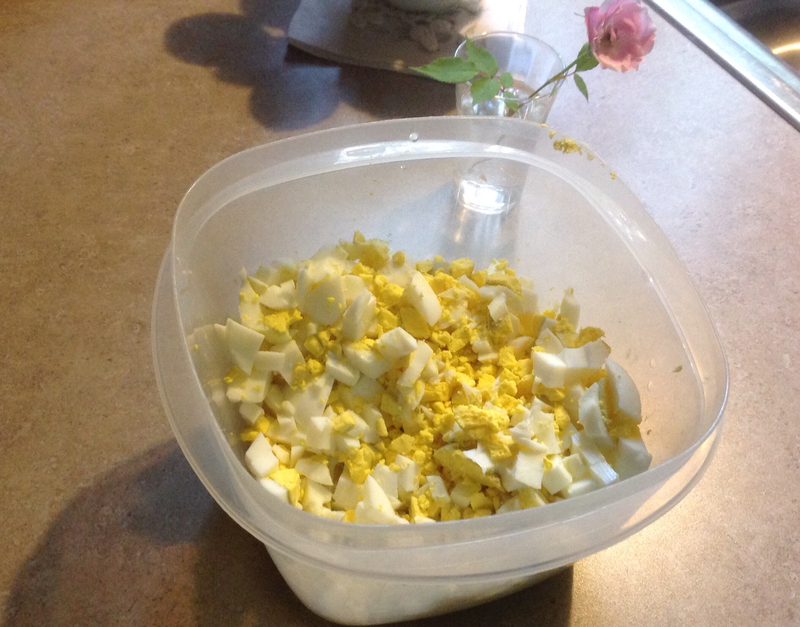 to be "Chopped Hard Boiled Eggs for Sandwiches" plan. and in a "flash" I was back in the forties! I couldn't believe there was actually a recipe. My mom made them often! and just like the recipe above said. Better Homes & Gardens Cook Book. shoes with a bit of a heel, white socks. small table, four chairs for mom, dad, Terry and me. to do what I had planned to do when my day began! cover, set timer for 12 minutes. Pour off hot water, place eggs in ice water. I have found that eggs which are a bit less than fresh, peel much better. A photograph is like the recipe — a memory the finished dish. Good morning, Lynne! I am easily distracted. Today is my do nothing day. I have never had Goldenrod Eggs, sounds like a yummy recipe. Thanks for sharing. Happy Tuesday, enjoy your day and week ahead! Thank you for sharing that recipe! I love it when something triggers a special memory. I'm constantly distracted. It might be all the multitasking. I wonder if technology is really a good thing somedays. Thank you for my birthday card, dear friend! Sounds like a wonderful day to me! I boil my eggs the same way! And, I am always distracted. So many wonderful things to do! I love this post Lynne, and your reminiscing of days gone by. Distraction sure can make for a long day of getting nothing done sometimes. lol I don't have a Betty Crocker cookbook - old or new. I've never heard of Goldenrod eggs before but I love egg salad sandwiches. I hope you get the garden shed cleaned out. Join the 'distracted' club. Loved this post. Awesome old cookbook, mine is a slightly newer version. My mom was always well dressed when she cooked. Usually a straight pencil style skirt and some kind of flat tennis shoes and a crisp blouse. Oh how times have changed... and now I am hungry for egg salad sandwiches! P.S. I live in a state of total distraction!! You took ME right back to the '40's...in my own mama's kitchen..she was dressed just like your mom...only we had an ICEBOX..a pretty, wooden thing that set on our screened in back porch...we finally got a fridge several yrs later. I have never liked Egg Salad sandwiches as I'm not a big fan of eggs..however, last week at one of my Bunco parties, she served Egg Salad Sandwiches, crust removed, and I think I had 3 halves...so so good. You're living my life, Lynne! I love egg salad -- one of my favorites. Oh, sometimes I get so distracted that things never get done right. But sometimes, they do. I've sort of given up worrying about it. Mostly!